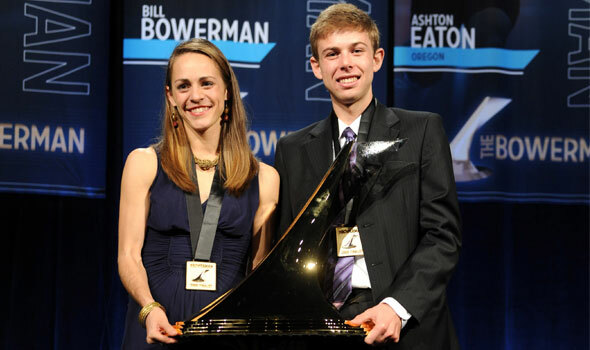 ORLANDO, Fla. – The Bowerman, an award bestowed to the nation’s top collegiate men’s and women’s track and field athlete, was presented to Galen Rupp (Portland, Ore.) of Oregon and Jenny Barringer (Oviedo, Fla.) of Colorado on Wednesday night at the JW Marriott Grande Lakes in Orlando, Fla. The ceremony, attended by over 1,200 people, took place in conjunction with the annual convention of the U.S. Track & Field and Cross Country Coaches Association (USTFCCCA). Not only did Rupp pull off an individual double-double at the indoor and outdoor NCAA Championships in 2009, he posted a new indoor American and collegiate record at 5000 meters in running 13:18.12 at the Tyson Invitational in February. At the NCAA Indoor Championships, Rupp helped Oregon to a national team title, accounting for 22½ team points, garnering national titles at 3000 meters and 5000 meters and as anchor leg of the Ducks’ distance medley relay. Rupp overcame near-disaster in the 5,000 meters at the outdoor national championships as he was stepped on early in the race and had to stop to put his shoe back on. In spite of the setback, Rupp came back to win the event by three seconds. Rupp was joined at the ceremony by his parents Greg and Jamie Rupp. Barringer had an amazing 2009, setting two indoor and three outdoor collegiate records on the track while adding two NCAA and two Big 12 crowns. Indoors, Barringer set all-time collegiate bests in three events over the span of five weeks. On February 14, it was a 15:01.70 clocking at Washington’s Husky Classic over 5000 meters that was the fastest time ever run by a collegian, all-conditions, indoors or outdoors. Two weeks later at the Big 12 Indoor Championships in College Station, Texas, Barringer blazed a 4:25.91 clocking in the mile to earn the conference title in the event. In another two weeks, she returned to College Station to win the NCAA 3000 meters in a collegiate record time of 8:42.03. Outdoors, Barringer broke her own collegiate 3000-meter steeplechase record twice and defended her NCAA title in the event while also recording an outdoor 5000-meter collegiate record. Barringer was joined at the ceremony by parents Bruce and Janet Barringer. Among his many feats, Rupp represented the United States at the 2008 Beijing Olympics in the 10,000-meter run. Barringer represented America at the 2008 Olympics in the 3000-meter steeplechase. The Bowerman is named in honor of track and field pioneer Bill Bowerman, who served the sport of track and field in numerous ways, including his leadership in the USTFCCCA’s predecessor organization, the National Collegiate Track Coaches Association, and his contributions to NCAA track and field and the running community as a whole. To watch a taped version of the ceremony, visit Flotrack.org. For more information on the USTFCCCA Convention, visit ustfccccaconvention.com. More details about The Bowerman can be found at TheBowerman.org. The U.S. Track & Field and Cross Country Coaches Association (USTFCCCA) is the non-profit professional organization that represents men’s and women’s cross country and track & field coaches in the United States. The organization represents over 8,000 coaching members, including 93% of NCAA track & field programs. USTFCCCA serves as an advocate for cross country and track & field coaches, providing a leadership structure to assist the needs of a diverse membership, serving as a lobbyist for coaches’ interests, and working as a liaison between the various stakeholders in the sports of cross country and track & field.